Waxing Existential: New Year, New You? A New Year’s Resolution in my estimation is about change, but it carries with it a heavy burden: lack, deficiency, and maybe even shame. If one of these propels one into creating the resolution, it is often a different burden that appears to draw one forward: perfectionism. We see evidence of this all over the media at this time of year. New Year, NEW YOU!! It is especially insidious from the diet and exercise industry. From Halloween through New Year’s Eve we are bombarded with the message to indulge and then “reality” hits. We have been “bad” and now we have to “pay” by going on a diet, doing a cleanse, hitting the gym hard, stop doing this and start doing that. Redemption, my dear… redemption. The actual definition of resolution is about the process of resolving, of finding a solution, moving from dissonance into consonance, and bringing something/persons/nations together. It’s about harmony. I believe it must begin with acceptance. The intention for resolution, when it comes from self-acceptance, brings with it the understanding of the inherent fluidity of life, including its limitations. Is this what I really want for myself/my life? What is my intention to make this change? Does my intention to resolve this part of my life align with my core values? Can I accept where I am and respond to my desire for change or resolution with understanding and compassion? Now, look at the part of the definition that has to do with image and photography. Resolution, in photography is about quality and sharpness. Higher resolution means more image detail. Here’s a different aspect of change to consider. What do you really and truly want to focus in on today? Not tomorrow, next Monday, or this year—today. How would you like your focus to be sharper, clearer? 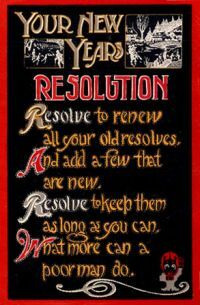 Take heart, New Year’s Resolvers! The New Year can feel fresh and new and filled with the energy of beginning and moving ahead. This is a wonderful thing! But you were fabulous yesterday too. Organic resolutions are loving, accepting, and fluid, and don’t come from what you are lacking, but from who you are now, in all your being and “becomingness.” Resolve to be. And then find your harmonious convergence. Happy, healthy, joyous New Year to you!